and we are having a GIRL!!! We were both a little surprised, but we are excited. It will be nice for Morgan to have a little buddy. Plus we can reuse all her things, that is one less stress I have to worry about! We don't have any ideas on names yet, well, let me rephrase that. We each have ideas on names, but none we really agree on. SOOO, feel free to leave a comment ANY time during the next few month of any good names you come across. Keep in mind that we have a last name that is difficult to pronounce properly so it needs to be something a little normal. :) I will keep asking for name ideas until we get one we both agree on! * after we were done with our treats Melissa showed us how to make little girls bows, they were so cute! She could make flowers, fishys, and even a princess out of a bow. I WISH I had my camera! The little girls at their special table with flowers, tablecloth, and their own little tea sets with pink milk and everything. TOO CUTE!!! Cute Morgan in her pretty princess dress...just in case you didn't know this is Belle's Christmas dress. :) It was too cute!!! Aunt Melissa and the cute food she had for us. There were even cucumber sandwich's with the crust cut off!!! Jeff's sister Jen showing off her proper tea drinking skills. Jeff's baby sister Steph showing off her tea hat. Always keep your pinky up! 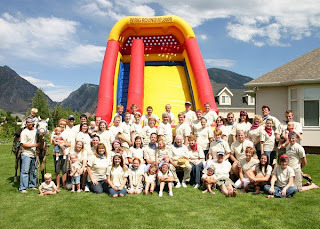 Two weeks after my family reunion we had a Wirig family reunion. 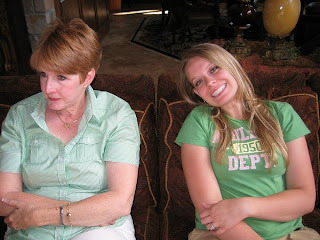 The Wirig's are my Mother-in-laws side of the family. This was the first vacation Jeff and I have had together since being in Colorado. It was a welcome break! Morgan and I drove over to Utah on Saturday, she did great we jimmy-rigged our dvd player so she could watch it and I listed to Twilight on CD. She watched Mickey Mouse Clubhouse ALL THE WAY THERE! I couldn't believe it, no complaining until I turned it off when we made pit stops! She didn't even take a nap. I feel kind of bad, but it was so nice at the same time. Jeff came in Wednesday after noon and we visited his old office and had a get together with the Sucher side of the family playing games and eating dinner. It was so fun to see all the Suchers who could come! Then the Wirig reunion started. It was so well planned (a special thanks to Danielle for organizing everything, good work!) 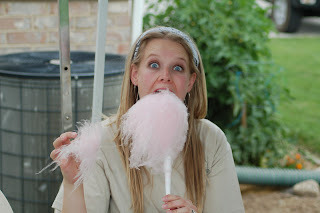 There was good food, snow cones, cotton candy, horse rides, dodge ball, fun kids games, family reunion t-shirts (I haven't ever been to a reunion with shirts before! ), girls day/boys day, talent show, swimming, a giant blow up slide, a special tribute to Grandma and Grandpa, and a special testimony meeting to close the week on Sunday. Good times were had by all. Having two family reunions so close together definitely made me so grateful for the two wonderful families that I get to be a part of. Jeff's aunt had this little suit that she let Morgan try...I don't think she liked it much but I thought it was sure cute! 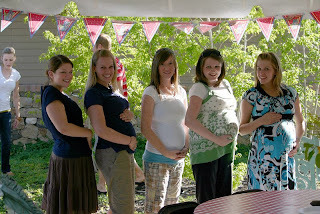 Here are the five pregnant ladies that were at the reunion. I think it ranged from like 37 weeks to 8 weeks! It will be so fun to have so many new babies! Here is the whole gang. Well we are missing a few families but these are all the people who were able to make it, quite the group eh? There were just too many cute pictures of Morgan to choose from! 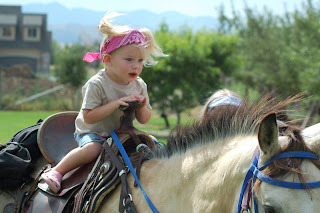 Morgan was so excited about the horses but she was pretty nervous once she got on it! 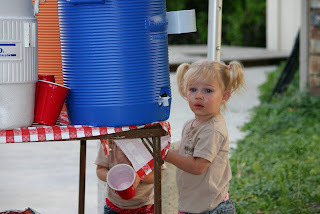 Here she is trying to sneak a drink. 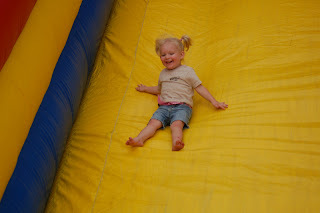 Morgan LOVED LOVED LOVED the giant slide. After she could do it all by herself she was on there for probably an hour and a half to two hours. 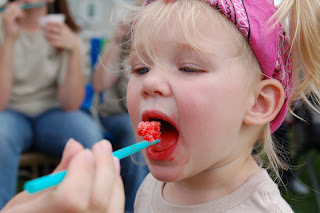 Morgan loves snow cones as much as mommy does! She doesn't love cotton candy as much as mommy does though. I gave her some and she just looked at me like I was crazy. This was a picture from out girls day. So fun! 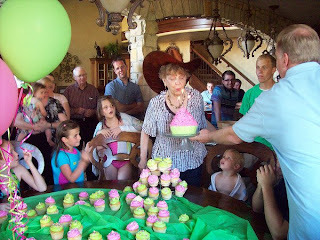 This was Grandmas birthday party. Since then Morgan has been obsessed with singing the happy birthday song. 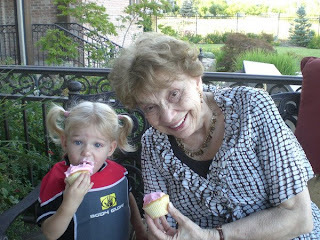 Morgan and Grandma enjoying a cupcake. 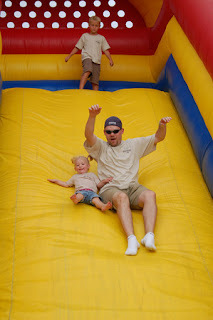 Morgan and Daddy having fun together. Well, I think that sums it up! What a fun trip! I can't wait to go back and visit! Well, I have searched my house and can't find my camera that I took to Idaho with me for my Smith family reunion, so this post will just have to do without pictures. I figure it is better to write it down than nothing at all right? For the reunion, it was just my siblings and their families. We were only missing two people: Jeff and my brother-in-law. This was the first time we had ALL been together for a long time, so I think good times were had by all. We mostly just hung out and enjoyed each others company. There was a float down the river, four wheeling, Bear Gulch, Gringos, wal-mart runs (no super wal-mart in Rexburg...I don't know how they do it! ), visiting the BYU-I campus, card games, late night talks, swimming, long drives, popsicles, family pictures, softball games, good food and good times. I think I covered everything! Anyway, it was a great trip and there is nothing like Sugar City and Rexburg anywhere...I love it. Maybe not to live, but to visit is great! Pretty healthy huh? :) Such is life. As long as I can keep it down right? Jeff has been great, bringing me mozzarella sticks at 10:30 at night, twinkies when I ask, what could be better? Morgan is getting bigger and bigger. She knows her alphabet song and can point out most of the letters in the alphabet. She can also count to thirteen! 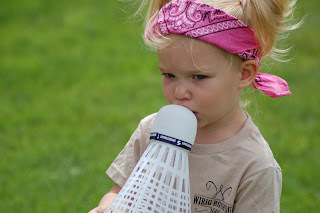 We thought that she could only count to ten, but one day she just kept on going! She has been doing all this for a while now. Although I would like to, I don't think I can take the credit. Between being sick with what we thought was mono and morning sickness there was a lot of Sesame Street going on. But hey, with those results who can complain right?